The What: Blackmagic Design has added real-time H.264 encoding to the Blackmagic Duplicator 4K. Now customers can choose to record H.264 for maximum compatibility with existing HD televisions and computers, or they can choose H.265 for delivering Ultra HD to the latest devices. Blackmagic Duplicator 1.1 update is now available as a free download from the Blackmagic Design website. The What Else: Blackmagic Duplicator 4K is designed to simplify the process of delivering multiple copies of content to customers the moment an event is finished. Blackmagic Duplicator 4K is an SD card duplicator with built in real-time H.264 and H.265 encoding. H.264 works with the devices customers have today, while H.265 is the new standard for delivering Ultra HD. The multi-rate 12G-SDI connections let customers record in all SD, HD, and Ultra HD formats, up to 2160p60. H.264 and H.265 encoding produces high quality video in small files that can fit on commonly available, inexpensive SD cards. Customers can even connect multiple duplicators together to make hundreds of recordings simultaneously. 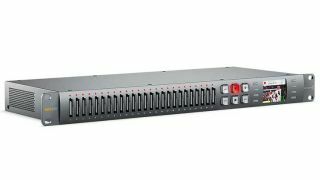 Featuring 25 SD card recorders miniaturized into a single rack unit, the Blackmagic Duplicator 4K uses standard, common SD cards that are readily available, inexpensive, and very fast. Cards can be used for SD, HD, and Ultra HD video up to 2160p60 and are compatible with Windows 10 computers. With the addition of a USB adapter, SD cards can even be plugged directly into most consumer Ultra HD televisions for immediate playback of the video. The built-in H.265 encoder allows an Ultra HD program to fit onto an 8GB SD card. SD cards are also easy to label and completely re-usable so customers can reformat unsold cards and record over them again at their next event. Unlike proprietary disc-based formats like Blu-Ray, customers don’t have to buy a slow and expensive player. The front-panel controls are designed to make duplicating content as easy as possible and feature six large, illuminated buttons for record, stop, lock, append, menu, and remote. The lock button prevents accidental interruption of recording during an event, and the append record button combines recordings from different parts of an event into a single file. The Bottom Line: The Blackmagic Duplicator 4K is designed to let content creators increase revenue by giving them a way to sell content right after a live event, while attendees are still excited about the performance. Now customers can sell concert videos to fans as they leave the venue, to parents after their children’s latest performance or recital, after sporting events, conferences, sales seminars and more.